First of all, I wanna thank all my new and old followers again! Reached 600 blog followers yesterday! Yay to all of you! 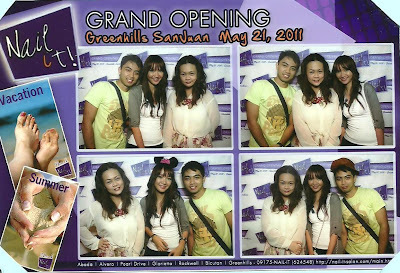 As what I've said on my previous posts, I was invited by Jariss (event organizer) to attend Nail it's Grand Opening at Greenhills last May 21, 2011. I was also informed that I can invite some of my highschool friends too. And glad I did! 4 of my friends including my boyfie got a 30 minutes massage. Me and Hazel got our manicure, pedicure and foot spa. Bf also got his foot spa. All 50% off! :D Promo is valid for that day only. 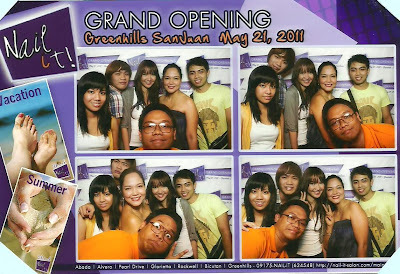 We also had a chance to take some photos for free with CHEESEIT Photo booth. The blessing ceremony started around 7pm and I think most of the guests are bloggers. Followed by the ribbon cutting. Here's a photo taken with my co-bloggers! Too bad, we didn't got any goodie bag! Errrr! I dunno why. :( So jealous with my co-bloggers. huhu. But anyway, the service are really affordable. I'm not saying this coz I got half the original price of their services but if you can really compare it to other salons its way cheaper! wanted to do a french tip also but decided against it coz i type a lot and it will just chip off right away.. I'm sohappy i found you at IFB and am now your latest follower!! I hope you are happy to follow back. Congrats on the grand opening....and congrats on the 600 followers!! Wow! What an inspiration to a baby blogger like me! Love your blog.Can we follow each other? I love going to Nail it! Honest to goodness Affordable luxury service. Nice post. When are they going to have a branch in Manila area and Taft along La Salle. Congratulations for a good write up. Congratulations for reaching 600. Nice pictures! looks like you all had a nice time during the Grand Opening of Nail it! 60???? So many! LOL Congratulations!! I wonder if we have Nail it branch here in Cebu... finally saw your boyfie...hehe.. You gurls look lovely as always! thank you so much deary! great! sayang you should have come to the event. aww. thank you so much deary! !